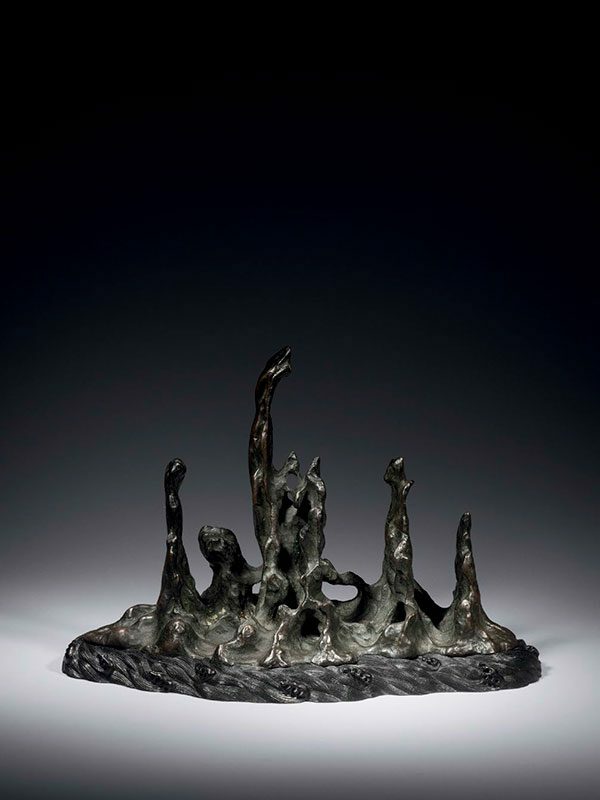 A heavy and large bronze sculpture or brush rest cast in a form of a mountain with five peaks, supported on a separate hardwood stand. The mountain has a stylistic, rocky appearance, with elongated, slender peaks. The tallest peak is in the middle and flanked on either side by lower peaks, each vividly swelling to steep inclines over cavernous valleys. The bronze has an even, dark brown patina. A two-character mark reading Cang Yun (literally meaning ‘hidden cloud’) is engraved on the back of one of the peaks. The hardwood stand is carved around the sides with a wavy pattern.